Overview - It's one crazy adventure after another for human boy, Finn, and his best friend, Jake, a 28-year old dog with magical powers. They're out to have the most fun possible and they sure do find it exploring the Land of Ooo! Whether it's saving Princess Bubblegum (Hynden Walch), battling zombie candy, taunting the Ice King (Tom Kenny) or rocking out with Marceline the Vampire Queen (Olivia Olson), with Finn & Jake it's always Adventure Time. Be sure to check out our review of the simultaneously released Season One set as well! Evoking a true sense of wonder is a very difficult task for any work of art, but the creators of 'Adventure Time' make it seem downright easy. Picking up where the fantastic first season left off, the animated series' second season progresses the show's trademark offbeat humor and goes on to further develop the series' gradually growing mythology and cast of enchanting characters. Filled with random silliness, witty comedy, fun action, and sprawling creativity, this collection of 26 episodes represents everything that makes the cartoon so refreshingly unique and endlessly entertaining, transporting viewers young and old to a hilarious and exciting world of gleeful fantasy. Season two once again follows the misadventures of Finn (Jeremy Shada), a heroic young boy, and Jake (John DiMaggio), his loyal dog, as they protect the magical, post-apocalyptic land of Ooo from various dangers. Episodes tackle everything from a quest to retrieve magical armor and excursions into snail dating to a journey to protect a batch of sacred royal tarts and an old school trip into a retro video game. And the season even raises the stakes by introducing a new, all-powerful threat in its climactic episodes –- the evil Lich King. Those familiar with the show's first season will know exactly what to expect here, and for the most part viewers simply get more of the same quirky adventure storytelling. Thankfully, that's far from a bad thing, and the writers demonstrate a slightly more fleshed out and ambitious scope. Episodic tales focused on Dungeons and Dragons style questing are still the norm, but a larger mythology is frequently hinted at in the background, laying the foundation for elements that will pay off in later seasons while slowly enriching the show's fantasy world and history. Threads seemingly abandoned in the first season are even picked up again (Tree Trunks returns! ), revealing that there may actually be a larger method to the show's random madness. Likewise, the characters' personalities and relationships are all further developed, helping to expand and enhance the series' already amusing ensemble. To this end, fan favorite supporting players like the Ice King (Tom Kenny), Princess Bubblegum (Hynden Walch), and the vampire rocker Marceline (Olivia Olson) all get several moments to shine. The Ice King's misguided quest for happiness is particularly humorous and affecting, and Tom Kenny continues to do fantastic work with the lovably pathetic wizard. Similarly, even one-off characters and background players are sparkling with personality, making each inhabitant of Ooo equally memorable and unique (the Royal Tart Toter and his soliloquy are among the show's high points). Of course, Finn and Jake remain the main stars, and the duo are still infinitely entertaining to watch, generating laughs out of every silly exclamation or expression. Their bizarre adventures are just as funny and creative as anything found in the previous season, and a few moral lessons even get sneaked in every now and then... sort of. You see, the show often subverts and eschews traditional children's show messages, and in the included commentaries the creators even discuss deliberately using "anti-moral" storytelling. To clarify, by anti-moral, they don't mean that they're deliberately teaching kids bad behavior. Instead, they're simply exploring the potentially good and insightful aspects of atypical solutions, choices, and attitudes that are often conventionally frowned upon in traditional kid's shows. For instance, several episodes seem to condone violence (against bad guys), and while under slightly different circumstances these conclusions might be off-putting, the tone is always spot on and the narratives make sense of the judgments, preventing the show from ever becoming irresponsible with its plotting. While not every episode is totally successful, even the show's lesser efforts are filled with abundant creativity and imagination. My favorites often feature Finn and Jake wandering into a field or forest and suddenly coming upon a random, strange new character who sets them off on a bizarre quest or gives them an intriguing item, and the writers and animators do a great job of creating a real sense of magic here -- like anything can happen at every turn. Oscillating between loud, larger-than-life excitement and hilariously low-key comedy, the show covers multiple temperaments while maintaining a singular style and tone. There really isn't anything else quite like 'Adventure Time,' and season two only improves upon what season one began, taking Finn, Jake, and the land of Ooo to new heights while paving the way for even more fun in later episodes. Warner Bros. brings 'Adventure Time: The Complete Second Season' to Blu-ray on a single BD-50 disc that comes housed in a keepcase with a carboard slipcover. 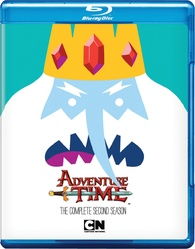 Much like 'Season One,' in a fun little design choice the slipcover is shaped to look like the Ice King's crown and beard with a cutout exposing his face on the cover art underneath. When the slipcover is removed, the full cover art exposes the character without his beard. A code for an UltraViolet digital copy is also included. After some skippable trailers, the screen transitions to a standard menu. The show is provided with a series of 1080p/VC-1 MPEG-4 transfers in the 1.78:1 aspect ratio. For all intents and purposes, the video presentation here is exactly the same as the simultaneously released 'Season One' set. Here's what I had to say about the transfers in my 'Season One' review: Simple but wonderfully creative and vibrant, the animation style absolutely sparkles on Blu-ray. With the exception of some extremely faint horizontal banding, the digital source is clean and pristine with no distracting artifacts. There is a slight roughness to the outline edges of characters but this seems to be inherent to the animation and not a result of aliasing. The show's modest but imaginative style is preserved beautifully, bringing all the wondrous characters and locations to life, and though there isn't a lot of detail in the traditional sense, the cartoon images pop with personality. Colors are bold and vibrant offering rich primaries that soak up the screen in cheery fantasy hues. Contrast levels are nicely balanced with bright whites and deep blacks. Outside of some negligible banding there really isn't anything to complain about here. The show looks quite lovely in high definition and fans should be very pleased. The series is presented with English Dolby Digital 2.0 audio along with optional English SDH subtitles. Like the video, the audio mixes all feature the same strengths and weaknesses as the 'Season One' set. Here's what I had to say about that release: While it's a bit disappointing that the show doesn't get a surround or lossless presentation, these lossy 2.0 mixes actually sound pretty good. All the characters' witty and absurd dialogue comes through cleanly with crisp fidelity, making sure that the all the nuances in the voice actors' delivery is preserved. Effects work and music are nicely spread throughout the two channel presentation with pleasing directionality that sends various sword slashes, magic spells, and explosions to the left and right when called for. Though the tracks are certainly limited by the 2.0 presentation, the audio still offers a decent sense of space with what it has to work with, adding some auditory energy to the show's plucky spirit. Dynamic range is solid and there is some slight low frequency rumble to the show's action heavy moments. The series' frequent diversions into song are also nicely realized with no technical problems to speak of. Yes, it is a shame that the show hasn't been given a multichannel or, at the very least, lossless treatment, but the results are still rather effective, and to be honest, I never really felt like I was missing out on anything. Commentaries – Commentaries are provided on all 26 episodes with creator Pen Ward and a cavalcade of story board artists including Rebecca Sugar, Kent Osborne, Cole Sanchez, and Ako Castuera. Overall, these tracks are all very… special. Before the first episode plays, a message appears on the screen from Pen Ward warning viewers that he had to cut out some of the tracks' presumably more adult snippets and replace them with random ukulele melodies. On that same note, as the group begins their discussion, they decide to come up with a safe word to use to warn each other that the conversation is getting too inappropriate for the show's intended young audience. The word they agree upon? Orange Juice. This results in several stretches where the audio is suddenly replaced with humming and music. When the normal commentary resumes, the group is suddenly laughing followed by someone saying "orange juice," leaving the source of all their amusement a mystery. The whole procedure is thoroughly bizarre, but I wouldn't have it any other way. Quirks aside, there is some decent production information buried beneath all the silliness, but the group gets progressively sleepy as their commentary marathon goes on (they recorded these all in a row) leading to trailed off speech and a very low key atmosphere. While these aren't exactly must listens, their unconventional aspects and periodic creative insights should amuse fans. The Crew of Adventure Time, Interviewed by Pendleton Ward (HD, 6 min) – Presented in 1080p with Dolby Digital 2.0 sound, this supplement features Pen Ward "interviewing" various crew members. After a few standard introductory questions, Pen shows each participant a short video. We can't ever see what they are watching, only they're amused (and sometimes horrified) reactions. Though this is pretty pointless, their varied expressions are actually surprisingly entertaining. 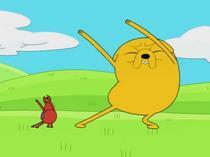 'Adventure Time: The Complete Second Season' gives fans another high quality batch of smart, silly fantasy adventures. The writing remains sharp and the creators show signs of evolving the show's mythology in intriguing ways. Like the last season set, the video is very strong and while not lossless, the audio mixes are still nice. Though there is only one featurette, fans should appreciate the unconventional commentaries on all 26 episodes. There really isn't anything else quite like 'Adventure Time' on TV, and the show continues to be a breath of imaginative fresh air. Highly Recommended.